We have worked hard on making the jobs.ch app even better for you! Thanks to more detailed company reviews, you can gain a better insight into interesting companies. Find out how current employees rate the salaries, career opportunities, work environment and management style. Rate your current or previous employer yourself and support others in finding the right company. What's more, you can follow your preferred companies and will be automatically notified when they have new job ads or reviews. 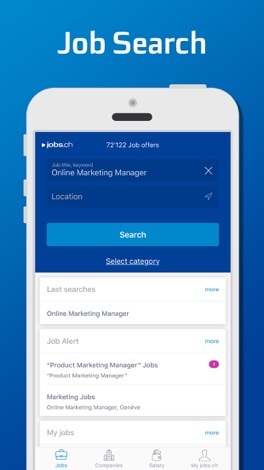 Do you like the jobs.ch app? Then we look forward to your review and your feedback if you wish to have further features. Anytime and anywhere access to more than 60,000 jobs and more than 6,000 companies, set a Job Alarm, compare salaries, follow jobs and companies, apply directly and review companies. With our job platform, we have everything for your job research. Why use the job app of jobs.ch? 1 – LARGE NUMBER OF JOBS & COMPANIES: Get access to more than 60,000 jobs from more than 6,000 companies. 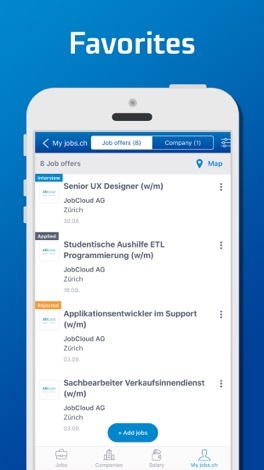 On jobs.ch you will find more job ads than anywhere else and a wide variety of companies in Switzerland. 2 – KEYWORD SEARCH: Your profession is in different categories and branches? No problem. Thanks to the keyword search you will find your next job. 3 – COMPANY SEARCH & COMPANY REVIEWS: Get an overview of your future employer thanks to our company portraits. Rate and review employers and companies to which you have applied yourself and gain a better insight into potential employers thanks to company reviews. 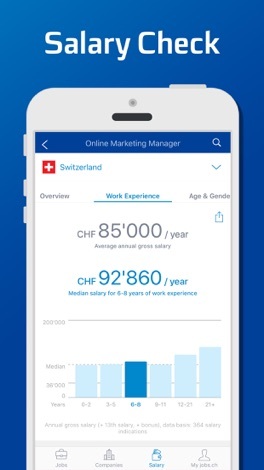 4 – SALARY CHECK: Compare salaries for all jobs and regions of Switzerland and be prepared for the salary question during the job interview and salary negotiation in your current job. 5 – LAST SEARCH: Save time by going back to your last searches. We have saved them for you. 6 – FOLLOW COMPANIES: Follow companies you are interested in and be automatically informed if new jobs and company reviews are added for these. 7 – DRAWING function. Do you want to work in an area that does not exist as a separate region? No problem. Localize your work region by using the drawing function and see jobs and companies from your requested area. 8 – Calculate the COMMUTE TIME: The time of travel to work is important. 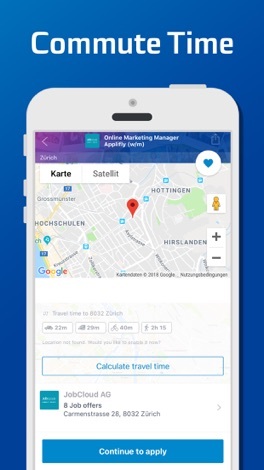 We show the commuting time for every job and company. 9 – APPLY directly: Send your application via app from your jobs.ch profile or your email address. 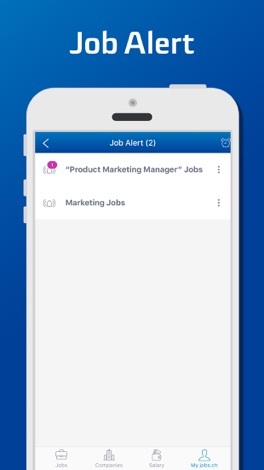 10 – JOB ALERT: Never miss out on any relevant job ads and stay informed about the latest ads thanks to the push notification. 11 – Time of PUSH NOTIFICATION: Do you want to receive notifications of new job ads at the same time? Set the time according to your needs. 12 – MEMORIZE JOBS: Save interesting jobs, wherever you are. Simply click on the heart icon and look in My Jobs later. Our tip: even if the publication has expired you can still have access to saved jobs. 13 – Personal PROFILE: Create your profile with our app and personalize your job search. 14 – GUIDED category search: Our guided search lets you filter your jobs easily by categories. 15 – FEEDBACK: Are you missing a functionality? Or do you have other feedback about our app? Then contact us by using the integrated feedback email. 16 – RECOMMEND: You see a job ad and you know a friend that might be interested? Share the job with the “Recommend” function. 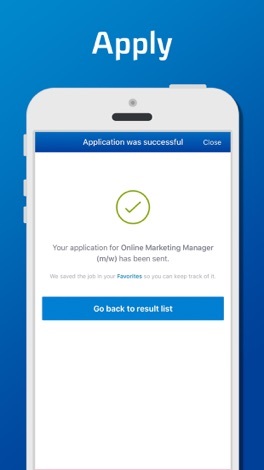 We wish you the best of success in your job search with our job app! Bokningsklient till webapplikationen myWebLog, ett bokningssystem för flygklubbar.